ANAMBRA - June 29, 2018, was indeed a black Friday for traders in Onitsha main market as their colleague simply identified as Ndubuisi Nwokolo met his untimely death at the hands of some gang members infamously known as Ikanda boys. The incident caused serious tension and pandemonium around the market areas as colleagues of the deceased stormed the streets in protest with, machetes and other lethal weapons, to register their displeasure over the neglect and unwillingness of the state government to tackle the insecurity in the market. Ndubuisi, a young man in his late 30s, an indigene of Onitsha who occupies a shop at Amazing Grace plaza in the biggest market in black Africa was hacked down and killed by the notorious criminal gang in broad daylight. According to a market source, the notorious gang leader fondly called Ikanda is a convict who was recently released from prisons by a popular gubernatorial aspirant at the last governorship election in the state. Ikanda was released and contracted by the politician as a political thug alongside his gang members during the November 2017 governorship election which later failed as a result of the massive boycott by the Indigenous People of Biafra (IPOB). Having failed to secure the number one position in the state, the politician who hired Ikanda for political thuggery, abandoned the notorious gang without making good his promises. Out of frustration, Ikanda resorted to constant harassment and forceful collection of dues from motorcycle and tricycle operators along the market axis. They were always seen around Otumoye street near the market which also serves as their illegal extortion point where they usually beat anyone to stupor who fails to comply. According to an eyewitness, this unsavory situation has continued for long since after the election, despite the fact that the market union has approached the state government to register their displeasure about the situation, however, the government appears to be indifferent in the whole saga, lending credence to the popular insinuation that the criminal gang of Ikanda are on a special assignment and also has the backup of the police whose checkpoint is a stone throw away from Otumoye street where these crimes have been committed unabated. The hopeless situation continued until Friday, June 28, 2018, when all came crashing down as the criminal gang members led by the ex-convict, Ikanda intercepted a motorcycle (Okada) conveying one Mr. Ndubuisi Nwokolo whom they wanted to extort money as this has become their normal routine. 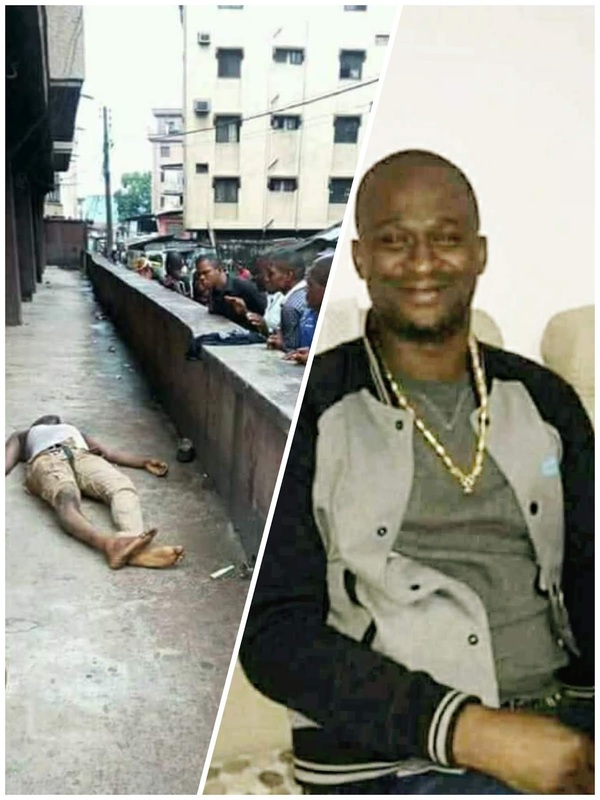 The eyewitness stated that the Okada rider pleaded he was just resuming duty and has no money on him but the gang vehemently refused and was threatening to confiscate his tricycle. It was at this point that Mr. Ndubuisi who was in a hurry to get to his shop intervened by giving them some money from his pocket which the criminals blatantly refused, saying it was not enough. In the scuttle that ensued, their leader, Ikanda pushed Mr. Ndubuisi down from the tricycle and slapped him heavily on the cheek. This forced the late Ndubuisi to retaliate and it suddenly led to a heavy brawl. Our Correspondent gathered that Ikanda who has found his match with Ndubuisi called his other gang members who arrived the scene on motorcycles and joined in the fight, beating and hitting Ndubuisi with clubs and metals until he fell down and died at the spot while the gang members dispersed into different directions. When the news of the young man's demise got to Amazing Grace Plaza where he trades, his fellow traders closed down immediately and embarked on a street-to-street protest in search of Ikanda and his gang. Many traders, out of anger, rushed to buy machetes used in the violent riot. In the process, people's properties and vehicles were smashed and damaged. It also affected many shops that were busy doing business, to send a message across to the state government who have severally ignored their calls to checkmate the excesses of the notorious gang. This incident boils down to the insecurity challenges and the state of anarchy which the country has lately become due to the complicity of the government and security officials in many heinous crimes going on in the country. When a group of well-known criminals are allowed to be forcefully collecting taxes from the masses under the watch of the police and the government of the day, it is a clear sign that the system has failed.